Longridge Cricket Club’s memorable year has seen them pick up a major award. 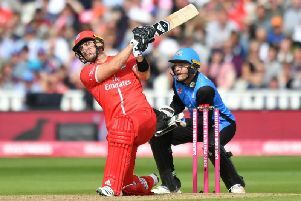 The Newsham Memorial Ground outfit were named Lancashire County Club of the Year at Lancashire Cricket’s end-of-season awards at Old Trafford. President Tom Haworth and vice-chairman Jim Blackhurst were there in person to pick up the award on behalf of the club. It came after Longridge romped to the Palace Shield Premier Division title and sealed a spot in the Northern Premier League for the first time in their history. The first XI, captained by Nick Wilkinson, won 19 of their 22 league games as they racked up 230 points in total to claim a first title in 14 years and sixth in total. Elsewhere, the second XI won the Loxham Cup for the fourth straight year. A hugely successful junior section also enjoyed a good summer with the Under-15s being crowned Lancashire County champions. The age group’s first XI also won Lancashire League Division One, with the second XI the joint winners of Division Two. The Under-10s and Under-17s both reached the Palace Shield semi-finals. “This is the culmination of a lot of hard work from an incredible group of volunteers,” said Blackhurst. “This award puts Longridge CC on the map in the county. "We’re a progressive, community-orientated club and this gives us a platform to attract a lot more interest in what we do. The awards were attended by the great and the good of Lancashire cricket with Preston’s Tom Bailey named the county’s first-team player of the year after being leading wicket-taker in Division One of the County Championship despite the Red Rose’s relegation. Longridge’s annual presentation dinner will take place this Saturday, October 13, at Ferraris Country House Hotel.